Nobody likes to think about disasters, but preparing for the worst is crucial to remaining safe when one inevitably strikes. Experts agree that disasters occur almost daily and may become more common. Taking time to prepare now can give you peace of mind in the future. We’ll walk you through some common disasters and how to prepare for and handle each situation. We’ll also cover how Vivint smart home technology can help with disaster risk reduction. Every family can do a few things to improve their disaster preparedness, regardless of location and the specific disasters might impact them. Other items to include depend on your family’s specific needs. For example, if someone has allergies, an EpiPen or Benadryl might be appropriate. No matter what disaster you face, take pictures of the damage for your insurance provider. Hurricane season is June 1 to November 30 each year, and thanks to climate change, we may continue to see severe hurricanes in the future. When you know a hurricane is coming, start preparing immediately. Have a go bag ready with clothes, a first aid kit, flashlights, cash, and other supplies you may need to evacuate or ride out a storm. Prepare your home by boarding up windows and securing any loose objects outside. There are generally two scenarios during a hurricane: either you are evacuating, or you’re riding it out. Generally, authorities recommend staying put unless an official evacuation order is issued for your area. In an evacuation, follow the exact orders given. If you are riding it out, avoid the roads as much as possible. Find a location in your home away from windows because if they shatter due to wind or debris, the glass can injure you. It’s also recommended you turn your freezer and refrigerator up to the coldest setting so that if power goes out, your food will stay fresh longer. After the storm passes, the first thing you should do is get in touch with loved ones and let them know you’re okay. If you’ve evacuated, remain where you are until local authorities clear residents to return home. This can take several days to a week, depending on the severity of damage and potential for traffic jams. Avoid driving on debris-heavy roads and stay away from flood waters. Vivint’s video monitoring solutions can let you view your home while you’re evacuated to make sure things are safe and sound. Floods are the most common and most expensive natural disaster in the US, according to the Federal Emergency Management Agency (FEMA). Floods can occur in any part of the country, although some areas are more prone at certain times than others, and they continue causing damage long after the water recedes. Make sure in-home electrical systems and furnaces are above the expected flood level for your area. If you’re building a new home, ensure water will flow away from the house and toward a drainage area to minimize risk. Also have some sandbags or other last-minute protections on hand in case of a sudden emergency. If a flood is imminent, bring in outdoor items, like chairs and tables, that might get swept away. A Vivint flood sensor can also help prevent/mitigate any damage. Avoid walking or driving through flood waters. Get to high ground if possible, but never enter moving flood water. It only takes six inches of flood water to knock you over, and a foot will sweep a car away. Remain on high ground until instructed to leave. If you evacuated your home, return only when emergency services tell you it’s safe to do so. Don’t drive through areas that are still flooded. 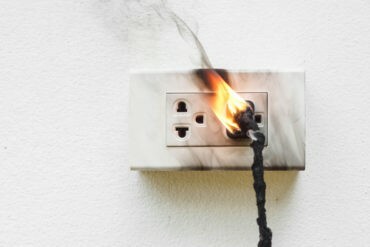 Make sure any electrical devices are completely dry before plugging them back in. Vivint can help keep your home secure while you’re gone. Motion-activated sensors and other smart meters can alert you if anything suspicious happens, and a monitored security system can also alert the appropriate authorities if needed. Fires are unfortunately common natural disasters, but with the following tips, you’ll be better prepared to handle them in your home. Have an escape plan in place should a fire break out. Know who will be responsible for whom, where you’ll meet outside the home, and what you’ll do next if the fire is bad and you need to stay somewhere else during repairs. Having a thorough, rehearsed plan is important—panic during an actual fire can cost precious time getting out. If a fire breaks out, a smoke detector will set off an alarm, and a Vivint representative will contact you and send help. When you hear the alarm, execute your fire plan. Stay low to the ground to avoid inhaling excess smoke. Exit the building as quickly as possible, and meet with your family a safe distance away. Authorities will assess any damage and let you know if the building is safe to re-enter. If there is a lot of structural damage and repairs are necessary, you may need to stay elsewhere. This is an emotional time, which is why your fire plan should include designating where you’ll stay. Not all areas are prone to earthquakes, but for those that are, it’s a hard disaster to prepare for, as there is often little warning beforehand. There are still some steps you can take, though. Ensure your home is structurally sound. FEMA provides guidelines for building new homes and preparing existing ones for earthquakes. Make sure any heavy, sharp, fragile, or otherwise potentially dangerous items in your home are secure. During an earthquake, drop to the ground to prevent the earthquake from knocking you over. Cover your neck and head to keep falling objects from hitting them. And stay where you are. Don’t try to move much or exit the building during the shaking. After an earthquake, use caution, as structures may have been compromised and there is a real risk of collapse. Stay out of buildings until inspectors have cleared them. If you’re trapped and need assistance, call for help. And be prepared for aftershocks. Follow the same procedures for these. If you have a home security system, you can use the control panel to contact the Vivint monitoring center and call for help. Disaster preparedness is a tough topic. Nobody likes to think about natural disasters happening to them, but being ready is important. These tips should get you off to a great start, and a home security system can also help you prepare. Check out Vivint’s equipment options for more ideas.